When we are being ruled by our anxieties and fear, this card of the Minor Arcana will appear. This will show us how we are setting ourselves up for failure. In periods of anxiety this Minor Arcana may appear within your tarot reading, demonstrating that the world you live in is being influenced by your expectations. You’re finding yourself fearful of the future, and uncertain of what it may hold, and this is leading to a lot of trepidation. Worse, you have little hope for a positive outcome, and are being overcome with despair. During the past period anxiety has ruled over you, you’ve been fearful about your future and where you’re going, and nothing has been able to convince you that a positive outcome is in any way a possibility. It has been a distinctly unpleasant time. These feelings of anxiety and fear are holding you back. As you think about the future and let your self-doubt fill it with terrible portents, you are building a self-fulfilling prophecy that will come true if you don’t change your mindset. The future is a scary place, and a circumstance is going to arrive that will cause you serious trepidation and make you begin to doubt yourself. It’s important that you don’t allow this to overcome you when it arrives. You can handle it, and positive thoughts will help you proceed. That mountain you’re stressing over? It’s a mole-hill. The Nine of Swords reversed represents your tendency to blow things out of proportion. This isn’t the same as the fear and anxiety of its upright meaning. 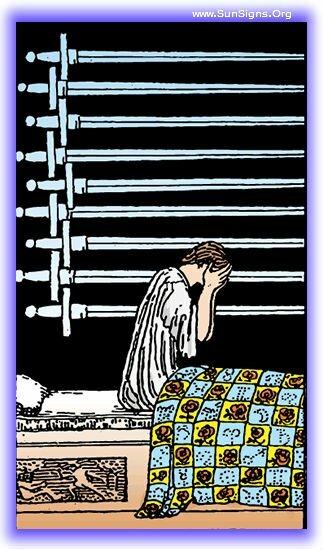 But heralds back to the Eight of Swords in being blind to the options that are open to you. Things aren’t as terrible as they seem, and a simple spade will turn over the obstacle you thought it would take an army to remove. 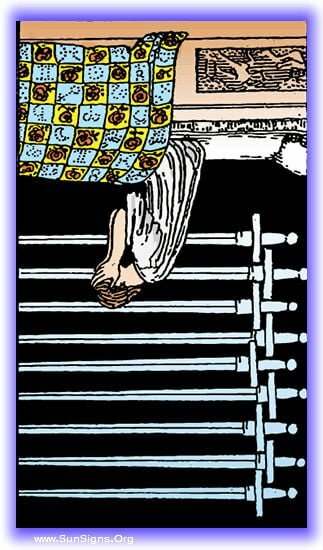 The tarot card appearing in this position indicates that you’ve gone through a period of worry and depression, but you are coming out the other side of it. Something has occurred that gave you perspective, and allowed you to overcome your more dramatic side. Whoa there little doggy, things aren’t so bad. Take a moment to step back from the situation that has you panicking, and give it a good long look. It’s not going to take nearly as much energy to remove as your panicking about it is consuming. With a little perspective, you’ll be able to move this obstacle out of the way, and go on. There’s a challenge coming, but it’s going to appear much larger at first than it actually is. It’s size is purely an optical illusion, and when you arrive, you’ll realize that it really is as small as it appeared at a distance. There’s no reason to fear it, just pick it up, set it aside, and keep on trucking.